He's played all over the world before aristocrats, dignitaries and even the pope. 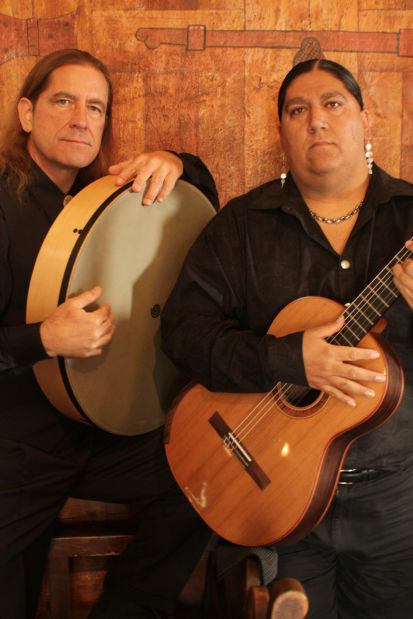 On Monday, Gabriel Ayala, Tucson's own guitar virtuoso, teacher, classical composer and recording artist, may play in front of President Obama during the Native Nations Inaugural Ball. Obama's schedule is not released in advance, but he is expected to visit several inaugural balls, and Ayala fervently hopes his will be one. Wow!" he said as he packed for this trip to Washington, D.C. He's been starstruck since he got a call from the ball committee asking him if he would like to play there. "Are you kidding? I'll pay to play there!" is how he replied, he said. Now that he's grown accustomed to the idea, he's a bit more circumspect: "What an amazing opportunity to showcase my music and to represent where I come from." Ayala has hardly recovered from playing in the Vatican for Pope Benedict XVI last October during the canonization of St. Kateri Tekakwitha, the first Native American to be declared a saint. Born and raised in Corpus Christi, Texas, and a member of the Pascua Yaqui Tribe, Ayala, 40, has lived in Tucson since 1995. He came here to pursue his master's degree as a guitarist. Obsessed with music, his fingers glide through the strings in classical interpretations or turn machine-gun quick on flamenco jazz. He perfected his craft by playing 15-hour marathon sessions and to this day rarely lets a day go by without practicing. Ayala has recorded classical, flamenco, tango and jazz CDs. Lately he has recorded original material in his own style he calls JazzMenco, a fusion of flamenco and jazz. Along the way he has garnered accolades and recognition, like being awarded "Native American Artist of the Year" by the Native American Music Awards. On Monday, Ayala plans to play "Inhiapsi" ("My Heart" in Yaqui), the same original composition he played for the pope. Though a master of the classics, he wants to showcase his own material, he said. With him in D.C. is the instrument he uses for very special occasions: a custom-made, cedar-and- Brazilian rosewood classical guitar made in Italy. Bought in 1994, the $10,000 guitar is the one he took to Italy, and he figures President Obama should hear it as well. "As long as I am going to play for the president," he said, "I feel I should take the best."